The Cleveland Cavaliers selected Kansas swingman Andrew Wiggins with the top overall pick in the 2014 NBA Draft. Wiggins joined the Cavs after spending one year with the Jayhawks. Wiggins was the second-straight Canadian-born player to be taken with the top pick. The Cavs also selected Anthony Bennett with the number-one pick in 2013. With the second overall pick in the 2014 NBA Draft, the Milwaukee Bucks selected forward Jabari Parker. Many believed the Duke product could have just as easily been taken by the Cavs at number-one. At number three, the Philadelphia 76ers chose Kansas center Joel Embiid. With the fourth overall pick, the Orlando Magic selected Arizona forward Aaron Gordon. The Utah Jazz took Australian guard Dante Exum to round out the top five. With the 11th overall pick, the Denver Nuggets took Creighton sharpshooter Dough McDermott, who was later traded to the Chicago Bulls. Other notable players selected outside of the top 10 in the 2014 NBA Draft include T.J. Warren, Adreian Payne, Gary Harris, Rodney Hood and Shabazz Napier. 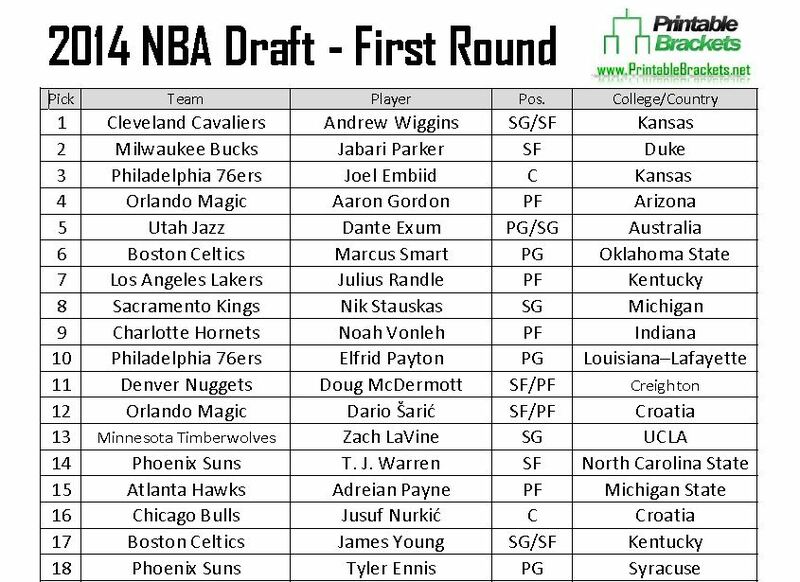 The 2014 NBA Draft marked the first time a player from the NBA D-League was selected in the first round. Texas Legends guard P.J Hairston was taken by the Heat but was later traded to the Hornets. The 2014 NBA Draft may always be best remembered for the ceremonial selection of Baylor big man Isaiah Austin, who was unable to play in the NBA after being diagnosed with Marfan syndrome. Austin, who was projected by many to go in the first round, was ceremonially picked by the NBA in the middle of the first round.